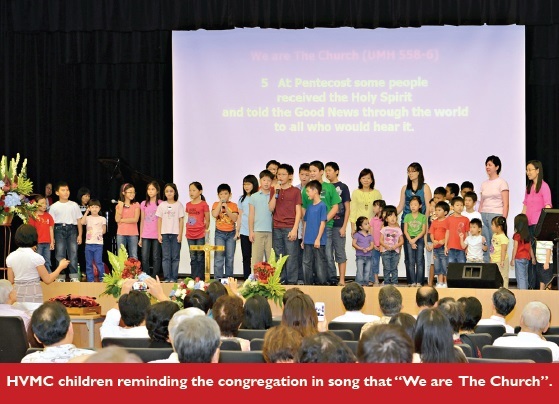 FIVE YEARS AGO, on July 8, 2007, the first worship service of a fledging preaching point in Anglo-Chinese School (International) or ACS (Int) was held. 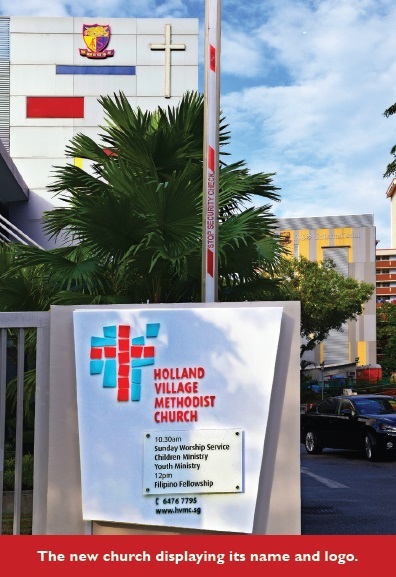 is year, also on July 8, that same preaching point was constituted as Holland Village Methodist Church (HVMC), the 45th local conference in e Methodist Church in Singapore, and marked its coming-of-age with an Inaugural Service and celebration lunch. 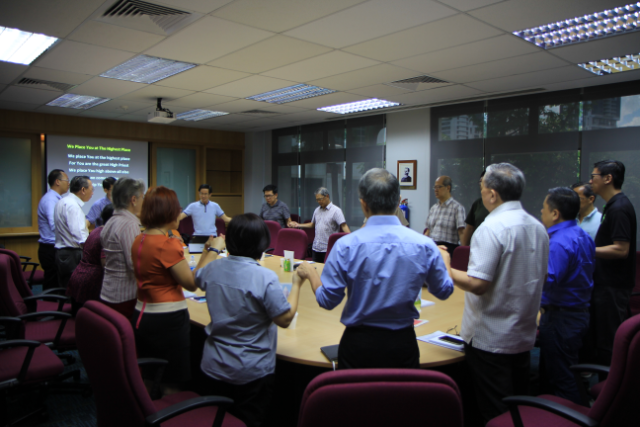 It was the culmination of a dream that began in 2005 when a small group of ACS (Int) staﬀ and BRMC members started a weekly prayer meeting in the school, asking God for a preaching point to be started in ACS (Int). 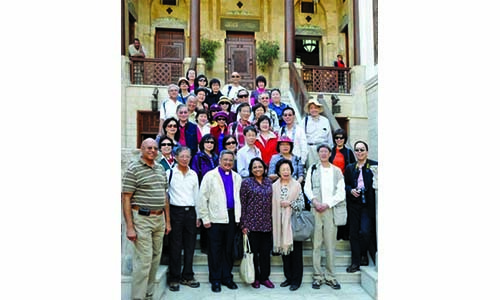 According to Mrs Tan Siew Hoon, the Head of Faculty (Humanities) in ACS (Int), the group members had caught the Methodist vision and mission for every Methodist school to house a church in order to reach out to the students and surrounding community. That vision was realised on July 8, 2012. 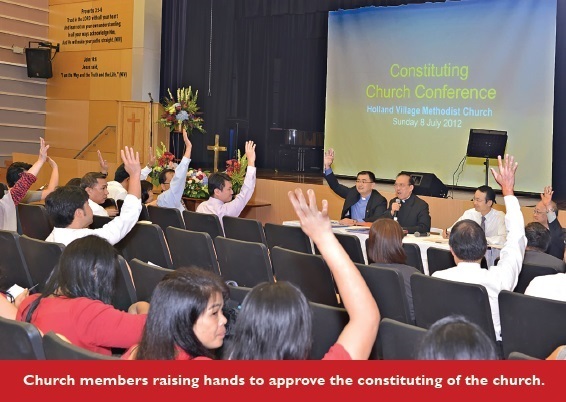 Early in the morning, the Constituting Church Conference and first Local Conference was held. 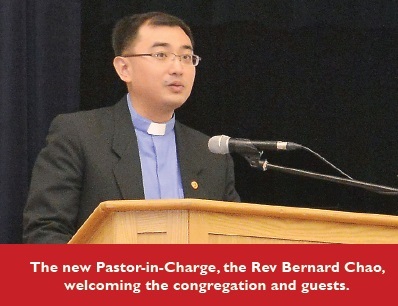 Five young persons who had been baptised as infants were first confirmed by HVMC’s new Pastor-in-Charge, the Rev Bernard Chao, before 132 founding members were received. The conference proceeded smoothly, with nominations, elections and administrative matters unanimously agreed on by all present. At last it was declared that the church was duly constituted and organised as the 21st local conference of Trinity Annual Conference (TRAC). As the founding members gathered for a photograph, excitement and joy was in the air. After all the planning, praying and preparation, the church was oﬃcially formed. The festive spirit was palpable at the following Inaugural Service, as congregation members and well-wishers greeted each other and flowers adorned the altar table and lectern in Oldham Chapel. 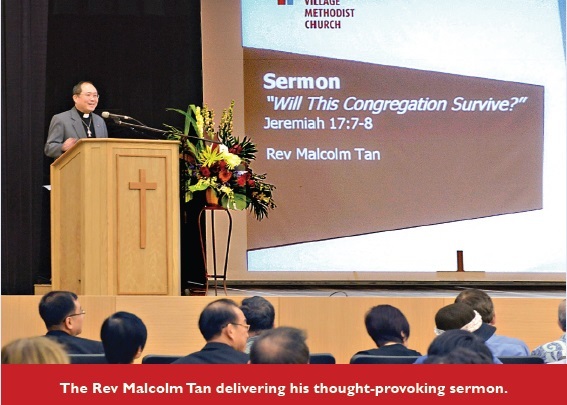 The Rev Malcolm Tan, Pastor-in-Charge of Barker Road Methodist Church (the “mother church” of HVMC), introduced his sermon with a provocative title: “Will is Church Survive?” is question, he said, is a good one which all Christians must ask of every church. He pointed out that Matthew 16:18 reveals the “sure promise” of Jesus Christ that the Church will prevail despite the reality of spiritual conflict, and that God’s plan or business is to gather people unto Himself. Therefore, the purpose of a church is to be a witness and testimony to the truth of Jesus as our Redeemer, holding to the principle of “stick to your core business” and testifying about the goodness and grace of God. With that, the church can have a perspective of certainty about its future as long as it remains God’s instrument to oﬀer Christ to those who need Him. to welcome the Holy Spirit with “ is Is Your House” and other lively songs of praise. The congregation was moved when the Rev David C.S. Wee, who had nurtured Holland Village Preaching Point for the past four years, led in a prayer that the church may be used to fulfil God’s wishes. The Rev Chao thanked all in attendance and read greetings from Bishop Dr Robert Solomon, who was unable to attend the service. TRAC Vice-President Mr Kim Seah expressed congratulations on behalf of TRAC and assured HVMC that “you are not alone”. Sharing in the joy of the newly-minted church were representatives from several organisations: TRAC, the ACS (Int) Board of Management, ACS (Int) management and staﬀ, Barker Road Methodist Church, and other TRAC churches. 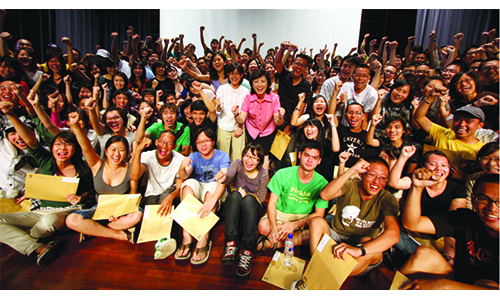 Students of ACS (Int) and their parents also showed support with their presence. Mr Mun Kwok On, Lay Leader of HVMC, gave thanks to God for the various people involved in the setting up of the church, and the Local Church Executive Committee Chairman, Mr Christopher Ong, presented a video detailing HVMC’s goals and explained the meaning behind the church’s logo design, highlighting the diversity of the church’s congregation. What struck the congregation was not just the warm support that HVMC received from TRAC and other churches, but also that within the entire service there was a message for the congregation. While the diﬀerent items making up the service – songs of praise, prayers, hymns and sermon – were handled by diﬀerent groups of people in the church, they seemed to all have been orchestrated by God. Each person consulted God in their own time, yet the end result presented a coherent message of promise and assurance. The church also unveiled its new website at www.hvmc.sg and invited all to visit its 10.30 am service on Sundays at ACS (Int), 61 Jalan Hitam Manis, Oldham Hall. After the service, a celebratory lunch was held for church members, friends and family as well as neighbours from the community – making good on the church’s commitment to be a blessing to the residents of Holland Village. Grace Toh is the Assistant Editor of Methodist Message. Laura Faulkner is a founding member of Holland Village Methodist Church.